Schuco Piccolo No. 701 Ferrari. 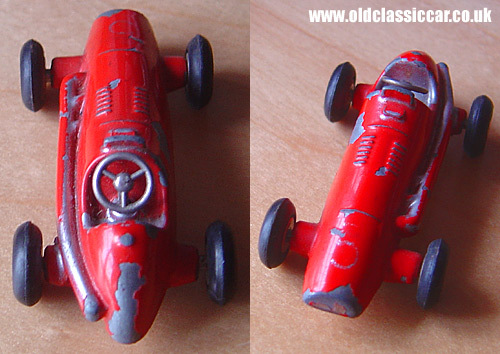 A toy Ferrari by the Schuco toy firm. Think of the Schuco firm, and it is often the tin-plate Mercedes racing cars that come to mind, with their nicely pressed tin bodyshells, and clockwork motors. 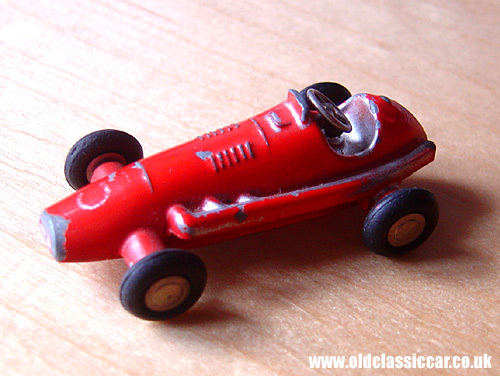 Alongside the expensive clockwork cars in the toy shop window, you might also find the tiny Schuco Piccolo toy cars. This example of the Piccolo, No. 701, is modelled on the Ferrari 500 Grand Prix car of the early 1950s. The body is die-cast, with steel axles and rubber tyres fitted. These toys didn't feature any form of propulsion, but as with the larger toys, they had some nice detailing, including a smart separate steering wheel. 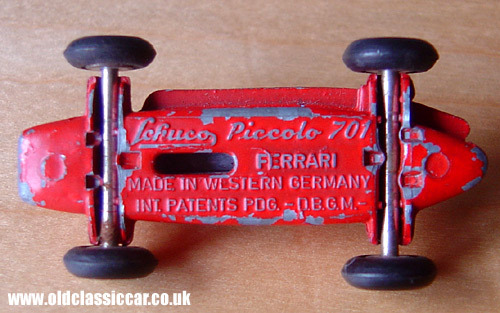 The Schuco Piccolo Ferrari measures just under two inches in length.